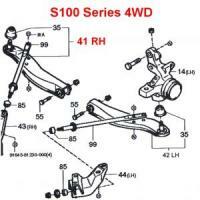 Daihatsu Hijet Front Lower A-Arm RH S100, S110P Series (all) 4WD. Include VIN number when ordering. When ordering please specify Power Steering or W/O Power Steering Option. Some vehicles were dealer option installed PS Units. If you have PS Option we must have your VIN number to complete the order.